Ahoy there me hearties! Your friendly app pirate is back for another application review I made for ye all lads. I’m proud to say that I completed all levels on the Cut the Rope game. Aye, this bucko is that good! Har, har, har! I really enjoyed the game that I even forget to feed me parrot friend at times. That’s why I was so happy when I found about the sequel of the game. I’ll tell ye more about it with this Cut the Rope 2 review. 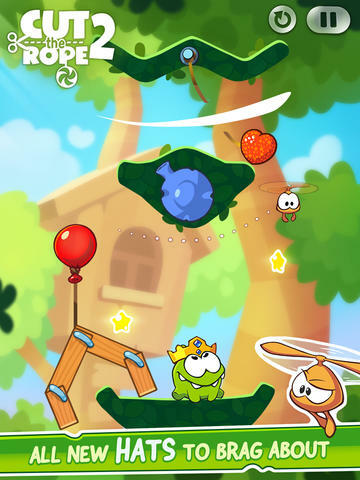 The general game play of Cut the Rope 2 is similar to the first version of the app. You will be collecting a candy on each level and feed it to Om Nom, which is the adorable green monster in the game. The story on how the candies of Om Nom were stolen by spiders and dropped in different places is shown when you start the game. This can be skipped though if you want to dive in immediately on the game. But it only takes a few moments to finish and it’s also fun to watch, so you might want to complete viewing it. If you played the first installment of the game, you would be familiar on what to do. But if you didn’t, that wouldn’t be a problem either since the first level on the first world, which is set in the forest, would give you a short tutorial on what to do. 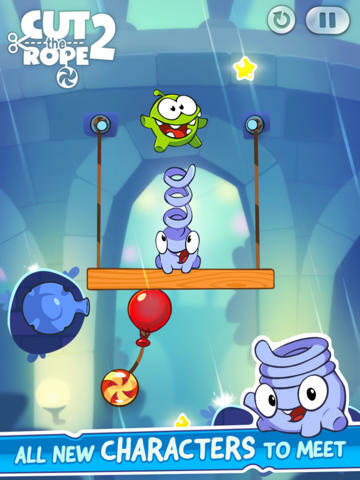 You basically have to cut the rope that holds the candy in order for it to fall in Om Nom’s mouth. You then move on to the next level. Aside from the rope, there are other objects that you will be dealing with on the other levels, making the game more challenging. What you would love on this version is that it has several new worlds, new levels, new characters that will help Om Nom with his quest, new missions and new power-ups. It has so much to offer making it enjoyable and challenging to play. The candies on the game are not just the sweetest things. Its graphics is also an eye candy. It’s crisp, vibrant and adorable to look at. Though the characters, objects and environment are cartoon like, even adults would be impressed. There are different backgrounds for each world level so you will not be bored with just one setting. Aside from forest, other worlds include junkyards, underground tunnels and cities. The sound effect and background music are animated. Every move you make has a corresponding sound effect, which adds life to the game. The music that plays on the background can be compared to something that you would usually hear if watching a magical adventure kid movie.